I have been temporarily thwarted by a stinking cold – completely knocking my get up and go out of me and making my nose rather like a leaky tap. After a warmer night in the cabin last night I woke up feeling like I had been steam rollered, but in true British fashion decided that a bit of salt air would sort me out. So, with a bit of Red Hot Chilli Peppers wafting out over the deck (ironically as the air temperature was struggling to make 10 degrees!) I rowed round the marina and out of the harbour. Sunny skies, not too much swell and a few white horses made for some nice rowing. I rowed into the wind, across it, down wind, across it the other way, checking out how the lovely ‘Dippers handles in all these situations. Having made my way through 8 packets of tissues and with (stupidly!) no nurofen on board, I decided to call it a day after 4 hours and have come ashore again to stock up on drugs, rest and try and clear it from my system. I had a bit of a battle of wills in making the call to come in – but figured that would be better than giving myself pneumonia. Big shame as the weather is perfect now – flat calm and I think tomorrow is bringing in a change, with some galey actions. Grrrrr…. Massive thank you to the folks at Brixham Marina for letting me come in and sit inside to warm up, making me hot drinks and looking after me. Very much appreciated indeed and I can well recommend them for a friendly welcome and fine services. So fine, I fell asleep in the shower this morning when I came back in to warm up! 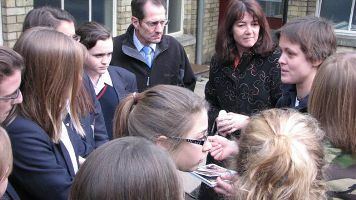 In the absence of pictures from my row this morning (I don’t have the connecting lead from my camera) I have attached a picture from my day at my old school, the Stamford Endowed Schools, last week. This picture shows me with some teenage girls – a bit of a contrast to the 7 year olds who had no qualms about climbing straight up on the boat and asking exactly what was in their heads. Very sweet – no airs and graces at that age! And with that I sign out to head to bed and make myself feel more human. It’s all about Beechams Powders and hot blackcurrant… Yum!